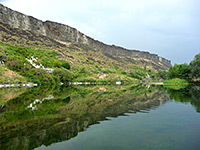 In 2005 several small parks were combined to form Thousand Springs State Park, which now consists of seven regions spread out over 15 miles of south Idaho, near the Snake River west of Twin Falls. 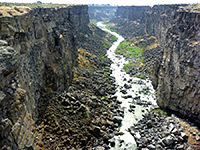 Like much of the south central part of the state, the bedrock is volcanic in origin and the river cuts quite a dramatic, sheer walled canyon through dark basalt, up to 600 feet deep. The porous rock readily absorbs rainwater, which sinks until it meets more impervious layers whereupon it moves sideways, emerging to form numerous powerful cascading springs close to the river level, seen most readily in the Niagara Springs and Ritter Island units of the state park. The other two main attractions of the park are Malad Gorge, where a tributary flows through a spectacular narrow canyon, and Earl M Hardy Box Canyon Springs, where springs emerge at the head of a short side canyon, forming crystal clear pools and then a sizeable stream. Other units of the state park (Billingsley Creek and Vardis Fisher) protect important wildlife habitats centered on a shallower valley, while the small Kelton Trail section contains a short segment of a historic travel route between Boise and Kelton (in Utah). The surrounding land is quite well-developed, primarily for agriculture, and many of the springs have also been used, for irrigation, power generation or fish breeding; others lie on private land, and the state park is not in general particularly peaceful or natural, and there are very few trails; the two highlights are Malad Gorge and Box Canyon Springs. A $5 fee is required for entry, good for all Idaho state parks on the day of issue. The approach to the Niagara Springs unit of Thousand Springs State Park is across a flat, dull, agricultural landscape of corn and cattle, along straight roads, to the edge of the Snake River canyon, then steeply down to the wide river banks. Most of the Niagara area is developed, including fields by the river, two extensive fish hatcheries, irrigation channels and various other buildings. The springs themselves, a National Natural Landmark, are right beside the road, not obviously signposted but quite visible, from only one viewpoint, as the surrounding land is overgrown and privately owned; on the far side of the road the waters enter a sluice system leading to one of the fish hatcheries. A side road shortly after enters the main part of state park - a picnic area and day use shoreline access - while the road continues another mile to Crystal Springs Lake, which is small but pretty, reflecting the basalt cliffs above. There are several springs on the far side, reachable by trail, though the near shoreline is rather dusty and/or muddy, so less appealing. The road then enters private land, belonging to another fish hatchery. Fishing is permitted in the lake and the river, here quite wide, containing exposed rocks and rapids in a few places. Earl M Hardy Box Canyon Springs is the least visited and least developed of the state park units, accessed by a 0.7 mile hike starting from a nondescript trailhead along a quiet country backroad, beside farmland and houses. Even here the $5 fee is due, via the self-pay system. The trail heads due west between two fields, and although there is no canyon visible at first, the rim soon comes into view. The environment is liable to be a little smelly, due to crop fertilization and cattle. The path descends slightly to a viewing area at the head of the box canyon, 200 feet above the floor, where the springs emerge, producing enough water to sustain a good size stream. The trail continues along the rim and a branch drops down to water level after another half mile, but there is no route back up to the springs. The ground either side of the river is rocky and overgrown and as there do not appear to be any easy climb down routes further upstream, the springs are not easily reached. 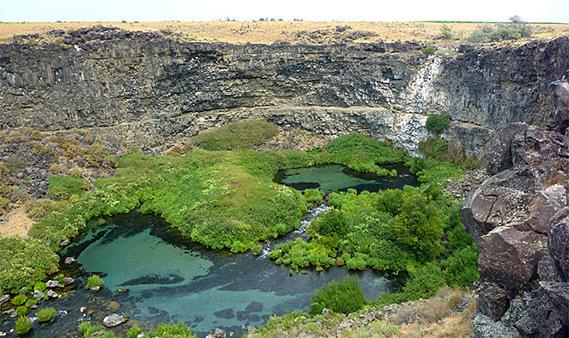 The view from above is quite spectacular though; the springs create beautiful pools of clear, shallow water, edged by bright green vegetation, below sheer, grey-black walls, stained white at the far upper end where occasional seasonal streams flow from the plateau. Ritter Island is a strip of flat land 0.8 miles long, bordering the main Snake River but cut off from the edge of the valley by a side channel. The island has a day use area with paths along the shore, and a historic house, originally a dairy farm. A bendy road winds down the cliffs on the east side of the river canyon, passing houses, irrigation channels and a power plant. 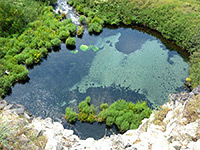 There are several springs along the cliff edge, the largest reachable by a short trail from below; otherwise the area is not very interesting. 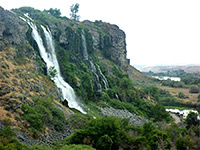 The Malad River forms a deep, vertical-walled gorge 3 miles long including a dramatic plunge pool (Devil's Punchbowl) emerging from the narrow upper portion of the ravine, a feature only slightly spoilt by I-84 which crosses the river directly above. The proximity to the interstate makes this the most visited of the state park units; access is from exit 147, a short distance east. There is one viewpoint by the falls, with a footbridge across the plunge pool leading to a rim trail on the far side, and several other roadside overlooks further downstream. 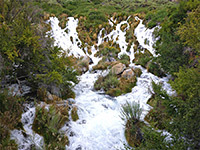 In winter when water flow is less, springs can be seen close to the waterline, but these are hidden during the higher and muddier conditions of summer. The lower section of the gorge (outside the state park) is accessible by road, starting from US 30. On the north side of the I-84 highway bridge over Malad Gorge, the small Kelton Trail district contains a section of the historic Boise-Kelton travel route, including abutments for a bridge over the river, and also a length of old railroad bed. 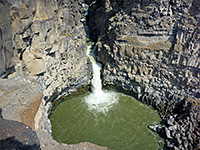 Short trails lead to the edge of the river in several places, including the points where the three branches of the river begin to cut down into the lava plateau. The Billingsley Creek unit of the state park protects 2 miles of a shallow stream meandering across overgrown, marshy land, and is popular mostly for wildlife viewing and horse riding. Named after a local author, the Vardis Fisher unit extends over another mile of the same creek, now flowing through a deeper valley, containing pools and springs, and several fish hatcheries.